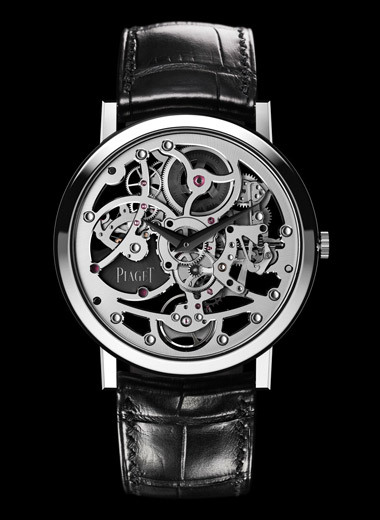 Although it was announced a couple of months ago, Piaget has now formally launched the stunning Altiplano Skeleton at SIHH 2012. At 38mm, this dress watch holds two ‘firsts’. At 5.34mm it is the world’s thinnest automatic skeleton watch and inside, it contains the thinnest automatic movement, the Piaget calibre 1200S, a mere 2.4mm. Through the open case back you can see that the movement’s micro-rotor is platinum and coated in a matte black. 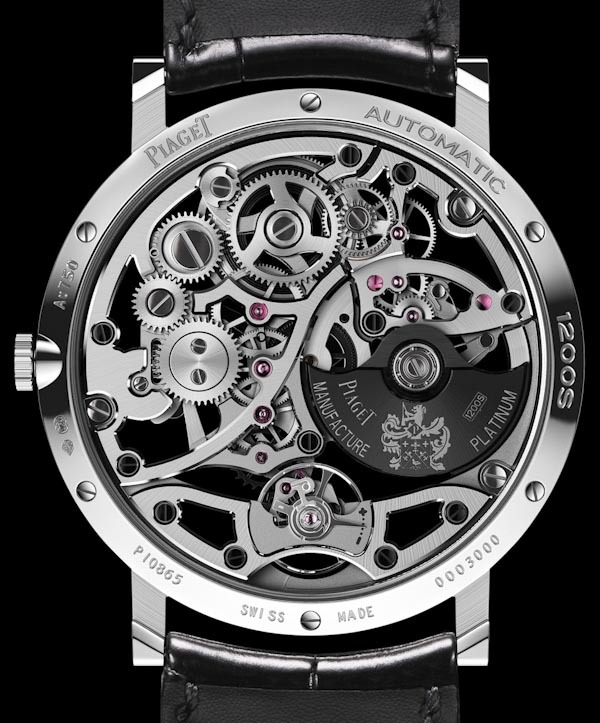 The 1200S automatic movement is based on the 1200P automatic movement, which Piaget modified and skeletonised. The engraving and finishing on the movement is all done by hand, and the contrasts and impact of the mix of surfaces (matte, sunray brushed, sandblasted, polished) with the polished angles, platinum, rhodium and black make this a very modern type of skeletonised dress watch. Renowned for their ultra-thins, Manufacture Piaget currently has 18 ultra-thin movements and 5 skeleton movements.